Why not look at the RMS Aquitania Captains page? Chirnside, Mark. RMS Aquitania: The ‘Ship Beautiful’. The History Press; September 25th 2008. Ninety-six pages. ISBN number: 9780752444444. Of the fourteen four stackers built, Aquitania was one of the longest lived and the only one to survive two world wars. Launched in 1913, she was the third four funneled liner for Cunard, and the only one not to have a Government subsidy. Aquitania entered commercial service in May 1914 and was christened ‘The Ship Beautiful’ thanks to her elegant interiors. Unfortunately, she was soon called up for war service as an armed merchant cruiser and her beautiful interiors either stripped out or covered over. A varied career as an armed merchant cruiser, hospital ship and troopship finally led into a successful period as a transatlantic liner and cruise ship before war intervened once more. Aquitania sailed again from 1939-46 as a troopship to far flung parts of the British Empire. From the USA, Canada and Australia to the Red Sea and South Africa, she helped ensure the shortening of the war by transporting hundreds of thousands of troops to where they were needed. Aquitania then went from carrying troops across the Atlantic and Pacific oceans to taking war brides and their children to their new homes. She re-entered commercial service as an emigrant ship, taking passengers to Canada and the USA until she was finally withdrawn in 1950, after thirty-six years of service under the Cunard flag. Mark Chirnside tells the story in words and pictures of one of Cunard’s finest liners, from her birth to her death, a journey that began on the Clyde and which then took Aquitania three million miles only to finish within twenty miles of her birthplace. ‘I ended staying up about 2 hours later than I normally do reading it. It’s a fantastic book, and I highly recommend it to everyone...who loves the liners of the Golden Age.’  Grant Carman, October 1st 2008. ‘I sat down and began reading almost immediately, and ended up finishing the book in one sitting. I was thoroughly engrossed from beginning to end. It’s an excellent book, and beautiful too in its colourful illustrations. I have no doubt it will quickly become a primary reference source for information on the Aquitania... it’s truly a welcome addition to those few titles presently available on this fasinating subject. The facts and statistics you’ve unearthed provide the kind of detail people have been waiting to read... As I’ve said, many have waited a long time for a book like this.’  Clyde George, October 19th 2008. ‘A terrific volume for an oft-overlooked Atlantic liner! ‘As a maritime researcher and author, when I hear about a new book my question is always: “What finds will there be inside?” This book delivers those “finds” in spades. ‘Mark Chirnside has written a number of books on the liners during the past decade; each one has been a gem in its own right. For this new book, Chirnside delved deeply into original archival material in order to produce facts and figures never before printed on the great liner. He is able to lay to rest some myths that have beclouded the Aquitania’s history, and to provide new insight on her incredibly-long and distinguished career. ‘…I came across your excellent book on the Aquitania and I couldn’t rest until I had reached the last page. Congratulations on a job well done.’  Ron Cater, November 14th 2008. ‘This book by Mark Chirnside pays tribute to a passenger steamer that - despite being amongst the biggest, most elegant and most popular liners of the early 20th century - has always been a bit in the shadow of the more famous fleet mate Mauretania. ‘Chirnside tells the eventful story of Aquitania’s successful and extraordinarily long career, from her start of service in 1914 until her end in 1950. In fact, Aquitania was the only one of the famous “four stackers” that served in both world wars. ‘The book features many high-quality photographs I haven’t seen before (with some beautiful colour photographs among them) as well as deck plans and a wonderful cutaway profile. ‘Cunard’s famous and beloved Aquitania is finally getting her life story told in depth. Mark Chirnside has done an outstanding job in digging up many, never before published facts, about the last great four-stacker, which served longer than any other Express liner in the 20th century. His research covers the ship’s very long and active sea career which spanned some 36 years. A career that included active service in various roles through two World Wars, as well as 443 voyages that saw her steam over 3 million ocean miles. ‘Although hers is a lengthy story, he has included a number of individual recollections of the ship from personal diaries. These accounts draw the reader in and they serve to remind him that this ship was, first and foremost, a carrier of human life. Whether it was a first class passenger crossing the Atlantic on business, an immigrant, heading to a new life in a new land, or most certainly a soldier, heading to a war zone with unpredictable consequences, this great ship directly impacted people’s lives, every time she sailed. Their story is also her story, and with the realization that she carried well over one million people in her lifetime, her historical impact actually boggles the mind. ‘...This is still a nice, pricey for the size (6 millimetre thick) softcover [original emphasis] book. I tend to want to see the ships through the eyes of the passengers, in colour. So, aside from the typical b/w photos, there are wonderful colour reproduction drawings, plans, posters, adverts, and photos unusual for books on liners of this era. But they are smallish. This could have been a more deliciously published book in hardcover with larger, page-bleeding and fold out visual items as in James Steele’s Queen Mary. The anecdotal/technical text is very interesting and enlightening. I give it five stars because it is a drop of water in a desert where good, name specific, ocean liner books are scarce. ‘It is packed with very interesting information and some useful photographs too.’ – Barry Driver, February 9th 2009. ‘The author chronicles all stages of the ship’s life in fascinating detail, from her birth at the shipyard at Clydebank, right through to her death at the hands of the scrappers’ torch at Faslane in 1950. There are many fine photographs both of Aquitania’s magnificent interiors and her excellent profile. A thoroughly enjoyable book, this volume is highly recommended to anyone with an interest in the great liners and the history of the Cunard Line.’  Tim Silcocks. Atlantic Daily Bulletin March 2009; page 25. ‘It is rare that an author’s introduction can be used to best sum up the worth of a book, but when Mark Chirnside penned these words, “It is such a gorgeous collection of rare, and visually stunning, images that have made this book what it is” he reflected my feelings exactly; it is a visual treasure trove of this lovely and beloved four-funnelled liner. ‘On one hand, this reviewer missed seeing images of the ship’s construction and scrapping, yet on the other, these are part of a potted history that is often best told in other publications. What RMS Aquitania is, is a book about the life of the ship and of those who sailed on her. ‘RMS Aquitania is well worth purchasing, and like the other Chirnside books that I have, is a book both treasured and well read. This book is a worthy coda to that tribute.’  Tim Trower. Titanic Commutator 2009: Volume 33 Number 185: pages 40-41. ‘I have always thought the four-stackers very evocative vessels; they suggest style, luxury, and sheer class, whether they belonged to North German Lloyd Line, White Star Line, or the famous Cunard trio, Lusitania, Mauretania, or, as it turns out, the more lavish Aquitania. ‘This book has 96 pages crammed with nostalgic paintings, photographs, and scale drawings of Aquitania, taken through her life from the builders yard of John Brown on Clydeside, to her final resting place a few miles down the river of her birth at Faslane. ‘…All the photographs and paintings are of excellent quality, especially the interior photographs of the restaurants, staterooms, drawing rooms, smoke room, gymnasium and cabins, and the grand staircases and foyers. However, I did find that the ship’s plans were hard to read without the assistance of a magnifying glass. ‘…I found this a super book, very intriguing mainly because so much has been written about the sinking of the Lusitania and the speedy Mauretania. The author has now done Aquitania proud with this great publication. ‘I thoroughly enjoyed this book, and recommend it to all ship lovers.’  Nautical Magazine 2009: Volume 281 Number 2: pages 125-26. ‘Book of the Month: Clearly the result of much painstaking research and a personal passion for one ship, the author of this interesting book has pierced together a splendid account of the record-breaking career of the 1914-built RMS Aquitania. An impressive array of colour and monochrome photographs and line drawings show the liner during her long and illustrious life as a transatlantic “queen,” troopship twice over, armed merchant carrier and hospital ship to name but four strings to her extensive bow. There are also a few very rare post World War II colour pictures of the ship looking respelendent in her Cunard livery. ‘The author’s careful research has uncovered several new facts and figures about this vessel’s long and distinguished career, and lays to rest some of the myths that once surrounded this fine ship. ‘This well reproduced book is an easy read and the nostalgic photos and technical information is supported by bonuses such as a detailed cutaway diagram of the ship. A highly recommended title to all those with a love for the traditional ocean liner.’  Ships Monthly, March 2009. 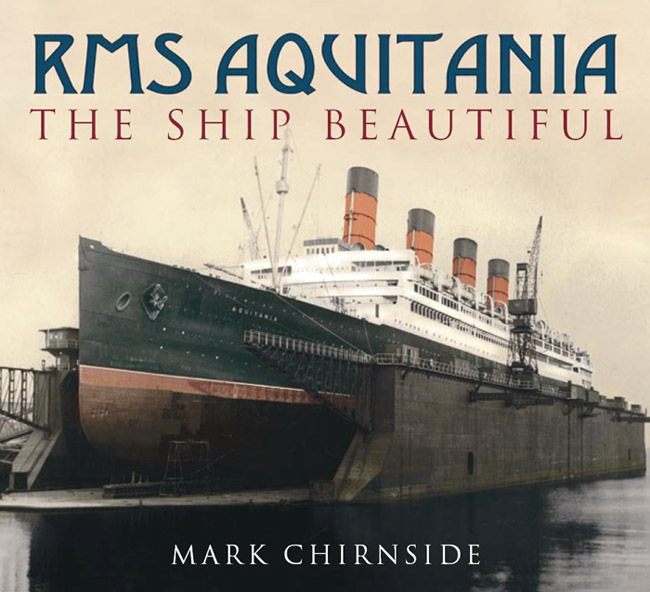 ‘The author, Mark Chirnside, takes great care to tell the lengthy and successful career of the well-loved Aquitania. The success of her two sister ships, Lusitania and Mauretania, which debuted in 1907 ensured that the Aquitania would attempt to be larger, faster, and more elegant than those before her. The book has well chosen accounts, many not previously seen before, of what it was like to travel aboard the ship, whether as a passenger, a crewmember, or a soldier. Each chapter gives a full history of the various stages in the liner’s career and is filled with many new pictures of the ship and her luxurious interiors. ‘Those of you who are interested in the technical side of ships and shipbuilding will be pleased with the numerous deckplans and details of various alterations over the years. All-in-all, this book succeeds on every level to bring the reader back to the glory days of ships and ocean travel. A must-have for any ocean liner collector’s book shelf.’ – Mike Poirier. ‘Book Looks.’ Voyage 2009; Issue 69: Pages 56-57.